Notice it also weights some bytes. This robots.txt file doesn’t actually physically exist in the root of your store. It’s actually a dynamically generated file which is generated because some of the new configuration options in Magento 2 admin that I’ll got through with you now. Why is there a blank dynamically generated status 200 page instead of a 404? Because Magento 2. Can you somehow disable it from admin and get a 404 page instead? No. What does robots.txt have to do with design one might ask? Nobody knows but still, let’s navigate to “Content > Design > Configuration”. In here you can open an accordion section titled “Search Engine Robots”. First thing you’ll notice is that these are blank. 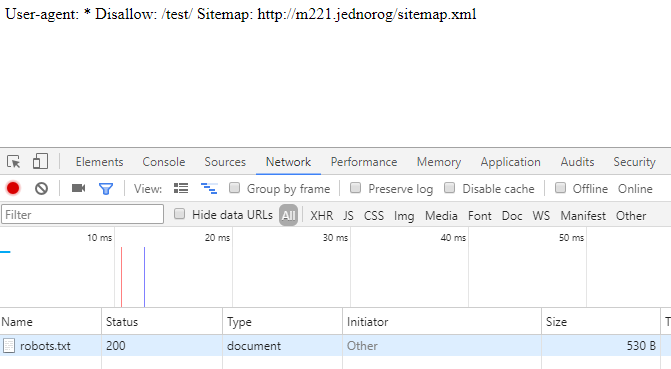 But why if your file already includes the sitemap directive we enabled in the previous section of this blog post? Because Magento 2. Lets add a few lines of code like in the screenshot bellow to the robots.txt file and see what happens, shall we? PRO TIP: If you’re having trouble saving the configuration at this step locally, try this fix, it worked for me. Why? Because Magento 2. A miss-formatted robots.txt file that doesn’t go into a new line where it should with a sitemap directive appended at the end of it. A badly written boilerplate for Magento 2 robots.txt file that I wouldn’t recommend using as it disallows everything with a parameter on the store. What happens if we now add a custom robots.txt file that is actually physically present in the root of your store? It completely overwrites everything we did in the previous steps. It disregards all the text you input in episode III as well as sitemap injection of episode II. And if you wrote it correctly, it works and is formatted correctly. At least for now, stick with adding the robots.txt to your Magento 2 stores the old fashioned way – add an actual text file to the root of your store.